Air Fry, Rotisserie & Dehydrate To Perfection! The Power Air Fryer Oven is a full oven multi-cooker that gives you all of the crisp, juicy, delicious & healthier benefits of oil-free air frying. 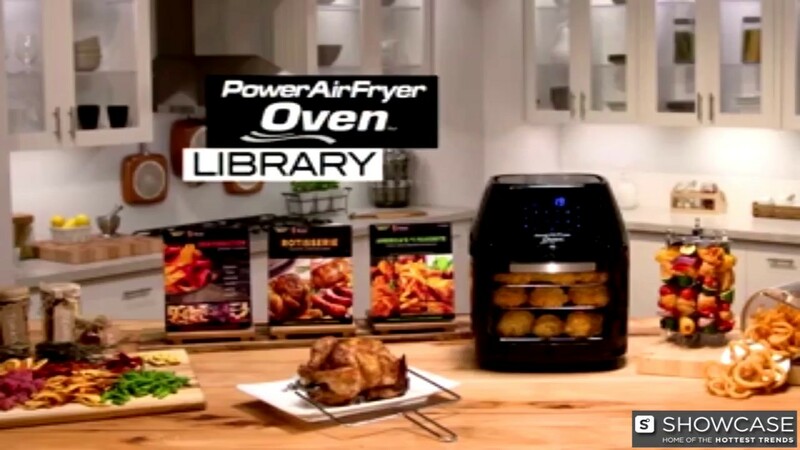 You get a state-of-the-art air fryer with an added rotisserie and dehydrator— all in one! Just choose from 8 One-Touch Pre-Set Buttons to air-fry extra crispy chicken fingers; air-fry rotisserie for savory pork roast, mouthwatering turkey breast, or authentic kebabs; you can even use the dehydrator to make healthy dehydrated vegetables, herbs, fruit, and more— with no added sugar. The secret is the stainless steel Air Flow Racks and 1700 watts of 360° Air Flow Technology. You food cooks on both the top and the bottom for that great crispy-fried taste and texture— without all the fat and calories! Includes 3 Air Flow Racks, Oil Drip Tray, and access to online recipe video library plus added BONUS FEATURES: Stainless Skewers, XL Rotating Mesh Basket, Rotating Rotisserie Spit, the entire AirFryer Oven Recipe Book Library: America's #1 Favorite Fried Foods Revealed 2nd Edition, Rotisserie Mastery Cooking Guide, and Dehydration Creations Guide. 8 preset smart buttons - no guesswork required! Crystal clear xl window – watch your meals cook! Replaces Your Deep Fryer, Rotisserie Oven, Dehydrator, Oven, Toaster Oven, Pizza Grill & Microwave!